The user-friendly graphic interface, together with the latest touchscreen technology on 22” widescreen monitor simplify and speedup all operations and program selection. No manual operations are required by the operator. “Combined” system, which includes an internal laser sensor and an external sonar sensor (TL3). The wheel balancer automatically measures the wheels without any intervention by the operator. All operations for the positioning of adhesive counterweights have been simplified. New Hidden Weight 2.0 programme to divide the external side balancing adhesive weight into two equivalent weights hidden behind the spokes.A completely autonomous operation. The wheel is braked and put in balancing position at the end of the spin (RPA). Integrated LED spotlight to light-up the work area and make it easier to clean the rim, and apply the counterweights.. Diagnostic system with sonar RunOut Detector Kit to reduce the disturbances (vibrations) generated by wheel geometric deformations. • In a single spin, it measures wheel radial runout and calculatesthe best coupling of the parts, thus solving the typical vibrations generated during road driving. • Simplified troubleshooting indications for the operator. 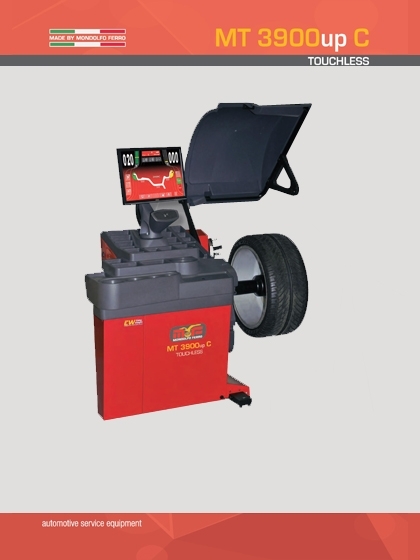 A special vehicle tyre set diagnostic tool. Once all wheel data are stored, MT3900up C suggests their optimal positioning on the vehicle for maximum comfort and vehicle safety. To improve the ergonomics and make the access to the inner part of the rim easier for the operator. It speeds up the different work programmes. The EASY WEIGHT programme suite including, among others, also the MINIMUM WEIGHT software, comes as standard. It allows reducing, also through the analysis of the different threshold values, the number of weights based on vehicle type: fast or slow (unique on the market).